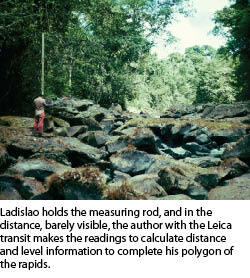 A geodesy student finds adventure while defining the boundaries of two gold mines in the lawless jungle of southern Venezuela. The Cessna landed on Main Street with a series of lateral bounces, avoiding all buildings and running pedestrians. The year was 1982 in a town in the Amazon rainforest in southern Venezuela, San Salvador de Paul (N 6° 02’ 49” - W 62° 52’ 39”), one of the most dangerous and foulest places on Earth. The government of Venezuela was issuing mining concessions to anyone interested in investing in the challenging business of exploring and exploiting gold and diamonds in the Amazon basin. These concessions were basically open-pit mines in which the vegetation was removed to expose the underlying sand that makes for most of the geology of the region. The sand contains rich deposits of gold (in its dust form, not nuggets) and diamonds. These two elements tend to deposit together, and therefore the exploitation is done simultaneously, to the detriment of the environment. I was in my senior year of geodesy at Universidad Central de Venezuela in Caracas, Venezuela, when one of my professors, Rodolfo Marin (a ficticious name), approached me looking for a surveyor to help him delimit the borders of his recently issued mining concession. At the time I was eagerly looking for some real-life surveying experience and quickly accepted. I was also recently married to Alison, and the news of my departure to the Amazon mines was not received well at home. 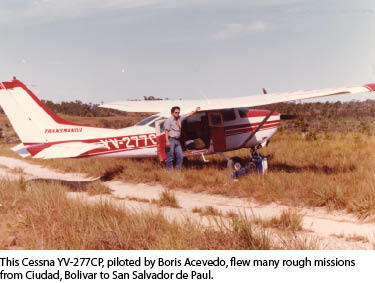 To make a long story short, I managed to convince Alison that the trip would be was safe, and a few days later Rodolfo and I were landing in San Salvador de Paul to begin my measurements. From my small window on the back of the Cessna I could barely see the chickens, pigs, and natives running through the thick cloud of dust away from the slowing aircraft. An oilcan piled on top of the outboard engine beside me fell on my head, causing the first wound of the long months ahead. I felt the warm blood staining my baseball cap while I held tighter to the T-1 transit between my legs; just in case …. The Cessna was coming to a stop, but it was not a quiet process—quite the opposite. Finally, the bouncing came to a complete stop and the engine died, allowing the dust to engulf the plane. cally, touching my head where the cap was all wet. “Thank you, ingeniero!” was the enthusiastic response from the young pilot oblivious to my sarcasm. Pigs and chickens were still running away from the plane, but now the locals were turning around and approaching at a fast pace; every plane that landed in Salvador provided a potential job opportunity to the locals. “I’m sure it is,” Rodolfo said, turning around and walking towards a soldier approaching the plane. 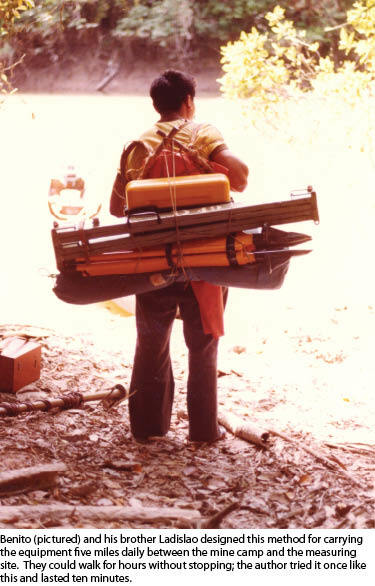 I began unloading the equipment: three tripods, engines, cans of fuel, and countless boxes of food and general supplies for the mine. Rodolfo and the soldier were having an agitated discussion about some papers Rodolfo was shaking two inches from the soldier’s face. A few minutes later an officer showed up, and after a few courteous words and gestures, plus the handing over of a thick envelope, the matter was settled, and Rodolfo was walking back to the plane. “Okay, people, who wants a job?” he shouted to the crowd of onlookers. Half the crowd ran towards him. 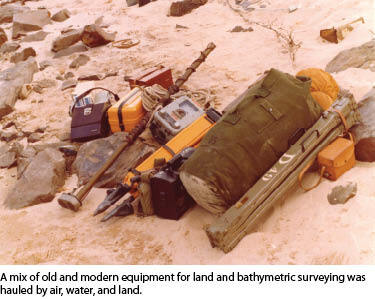 “We need to carry all this equipment to the river!” he shouted. “I will pay 10 bolivares to each man carrying a package.” The entire load was at the sandy beach in less than 10 minutes. 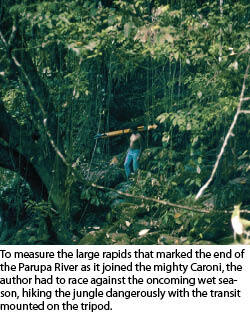 Two large dugout canoes were anchored right in front of the huge pile of equipment, and the four Yanomami men who worked for Rodolfo began loading them. The outboard engines came to life, and we were on our way to the mine. It took four hours to reach the closest landing site and another 30 minutes to walk to the improvised houses that made the mine camp. Rodolfo showed me my hut, and in a few minutes I was fast asleep; it was about midnight. The next morning Rodolfo introduced me to my two Yanomami assistants: Benito and Ladislao. They spoke a bit of Spanish, and between that and my hand gestures we were on our way to the surveying site. We spent the first day digging the hole and mixing the cement for the monument of marker C1; I proudly set the bronze plaque on the wet concrete later in the afternoon. The night came without a single cloud, so I took the opportunity to take some star measurements of latitude and longitude to provide the mine with astronomical coordinates (I was working on my thesis on new techniques using positional astronomy; see sidebar for more on that). The next day we arrived at marker C1 early, ready to begin our measurements towards marker C2. Benito reached the monument first, dropped the equipment on the ground, and came running towards me with a fearful expression. Benito pointed to the monument and said something to Ladislao in Yanomami. I walked to the monument, and to my surprise I found a paper note neatly folded on the bronze cap, with a stone on top. The note was an invitation for dinner from the owner of the neighboring mine; it was for that night and it clearly indicated he wanted to see me alone. I turned around and saw Benito and Ladislao side-by-side looking at me and whispering. “Gomes,” was the only word from Benito. “Who the hell is Gomes?” I asked, a bit exasperated. Both men lifted their arms in unison and pointed east without a word. “Enough of this Gomes nonsense, let’s work,” I said, putting the note in my shirt pocket. We made great progress during that second day, but Benito and Ladislao were distracted and whispered a lot. When we got to camp I walked straight to Rodolfo and showed him the note. “Well you are a surveyor, and you are surveying the line between my property and his; perhaps he wants to check you out,” said Rodolfo, exhaling a thick cloud of smoke and smiling. In less than an hour we reached the end of the infamous trail that Gomes had built to connect the two adjacent mine sites. The relationship between owners in this region was tenuous at best and downright adversarial at worst. Gomes’ camp was well lit with a central kitchen and smaller huts surrounding an efficient layout. One house in particular stood out as bigger and with a better palm roof than the others; it was no surprise to see Joao walking in that direction. Gomes opened the door to his house with a degree of ceremony clearly aimed at impressing me from the beginning. “Welcome to my modest home, Ingeniero Plaza,” he said. The house was modest but clean. In a few minutes we were having a delicious dinner of fried fish and the usual black beans and rice. After dinner, two of Gomes’ bodyguards approached me from behind and with no warning grabbed my arms. “Don’t be alarmed, ingeniero,” said Gomes, smiling and clapping his hands loudly. His wife Jelitza entered the room with a glass container filed to the rim with thousands of brilliant stones. Jelitza approached and ceremoniously placed a large linen napkin on the table right in front of me. Gomes stood up and walked the short distance, savoring every second of this private ceremony. “Ingeniero, cup your hands in front of the linen, please,” he said. “Wuh?” was my response. I was still trying to understand what was happening and not very eloquent at the time. “Like this,” he insisted while putting his hands together, forming a cup and imitating drinking from a fountain. I did as Gomes said. With a slight nod he instructed Jelitza to begin the pouring, and in a matter of seconds thousands of diamonds of every conceivable color, shape, and size left the flask and fell into my hands, filling them and falling to the linen in a surreal cascade of colors and texture. My mouth was wide open and I was getting dizzy. Gomes was smiling, clearly enjoying my reaction. “No, Gomes, you are wrong…” I said. With that statement he directed his attention to the pyramid of diamonds, grabbed a stone from the pile, and gave it to me. “This is for your wife,” he said. “Be on your way.” Gomes turned around and left while Jelitza and the guards placed the diamonds back in the flask. Minutes later I was on my way back to Rodolfo’s camp, engulfed by the deepest darkness imaginable, but oblivious to the dangers around me. That was my second day in the Amazon. The following eight months were, well, another story…. This story took place in the early 1980s when the surveying industry was in tremendous technological turmoil. Doppler was a household name and GPS was beginning to sound like a feasible technology in the not-so-distant future. At the same time, the first personal computers were beginning to show up in surveying companies as valuable tools to transform coordinates and compensate polygons in seconds instead of hours. The main difference with today was the complete absence of specialized software, so all programs used in surveying were developed in-house by the users, me included. with it to make geodetic transformations in a flash. Against the protest of my teachers I chose to write my thesis based on the availability of this new PC technology in order to rescue the old techniques of positional astronomy; in a few months I designed and manufactured a fully portable device (see photo below) to measure and calculate, on site, hundreds of positions (latitude and longitude) every night, providing an accuracy closer to 75 feet. 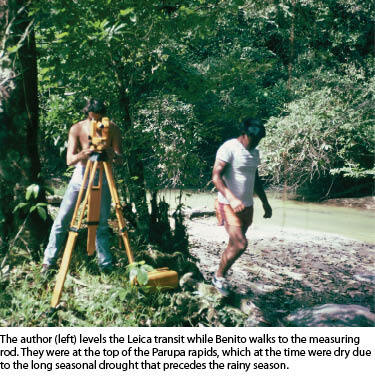 This accuracy was attractive only in areas such as the Venezuelan Amazon, where the only map available was the 1:25,000 developed in the early ‘60s. One millimeter on this map is equivalent to 75 feet on the ground, which was good enough for mining concessions in the deep jungle. However, it was understandable that my teachers wanted me to pursue a thesis where the goal was to obtain accuracies of millimeters and not tens of feet. A few days after the successful presentation of my thesis I received a visit from my old professor who explained his plans to obtain a mining concession in the Amazon; thus arose the first practical application for my new technology. I jumped at the opportunity, and in a few weeks I found myself looking at an unpolluted sky with thousands of stars to choose from. The new technology proved to be very reliable, and in a few days I had accumulated more than 500 separate observations of latitude and longitude of a single point within the perimeter of the mining concession. This position, monumented in concrete and bronze cap, became the coordinate origin of the mine. This monument, combined with a highly precise azimuth line, served as the beginning for the polygon that eventually encompassed the mining concession. The transits I used for the angle measurements of the astronomical positions as well as the polygon was a Wild T1 and a Leica, borrowed from the university; distances were measured using a measuring rod.